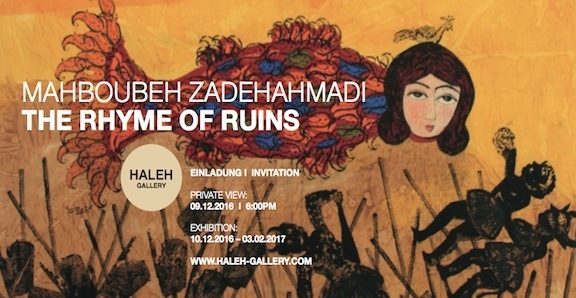 Haleh Gallery presents the solo exhibition The Rhyme of Ruins by the Iranian artist Mahboubeh Zadehahmadi. Mahboubeh Zadehahmadi (*1974, Isfahan, Iran) is an Iranian artist who creates her large-scale, pictorial worlds of textiles especially through the expression of the art of printing. Her works should by no means be reduced to graphic prints, but should rather be understood as an intermedial fusion of painting and printing. Mahboubeh studied art in Teheran and pursued her studies at the Fine Arts Academy in Munich with the professors Norbert Prangenberg and Günther Förg. Reading the lines of the poem, permits the beholder of Mahboubeh’s pictures a virtual immersion into the city of Isfahan. The square Naghsh-e Jahan is the city’s centre. The square has tremendous measurements of 560 meters length and 160 meters width. The blue tiles mosques are breath-taking masterpieces of Safavid epoch (1501-1722). The sqare merges several urban purposes and includes among others, mosques, a royal palace and a bazar. When you enter the bazar in Isfahan, one is surrounded by magnificent qalamkars, textiles printed with ornaments, patterns, and motives of heroic stories. Mahboubeh quotes the medium of printed textiles, which are famous for the city of Isfahan and their location of production. She transfers the traditional mean into contemporary painting. Mahboubeh plays deliberately with motives of Persian art, for instance Khorshid Khanoom, Mrs Sun. The Sun in Iran is being represented as beautiful and attractive woman, with wide eyes, a continuous eyebrow and her black hair emphasizing her smiling face. The concept of textiles, as weaved fabric, continues substantially in Mahboubeh’s artistic works, as the artist has pointed out in the last line of her poem. Everything is interwoven with one another and that creates a wonderful piece of art. Mahboubeh Zadehahmadi (*1974 in Isfahan, Iran) lives and works in Munich. She studied art at the art academy in Tehran and painting at the Fine Arts Academy in Munich with the professors Norbert Prangenberg and Günther Förg. Exhibitions (selection): “Red”, Haleh Gallery (2013/14), Haus der Kunst München (2009), Golestan Gallery, Teheran, Iran (2009), etc.